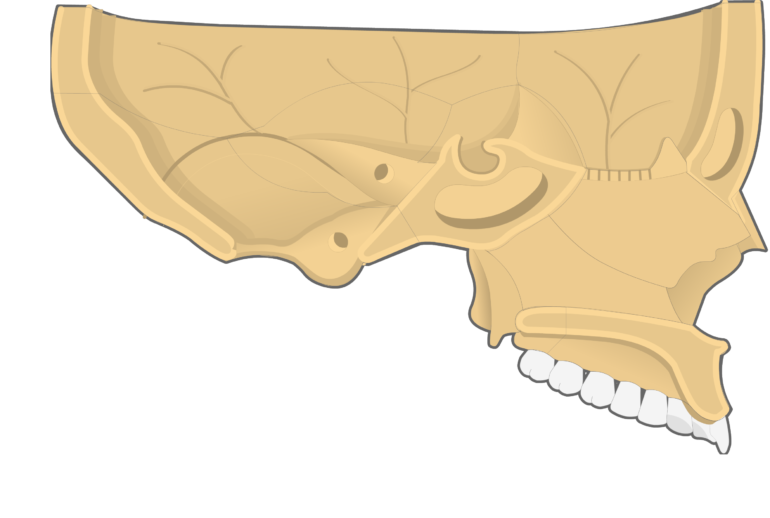 Compared to the maxilla and mandible, the other facial bones are relatively small and have few distinctive markings. 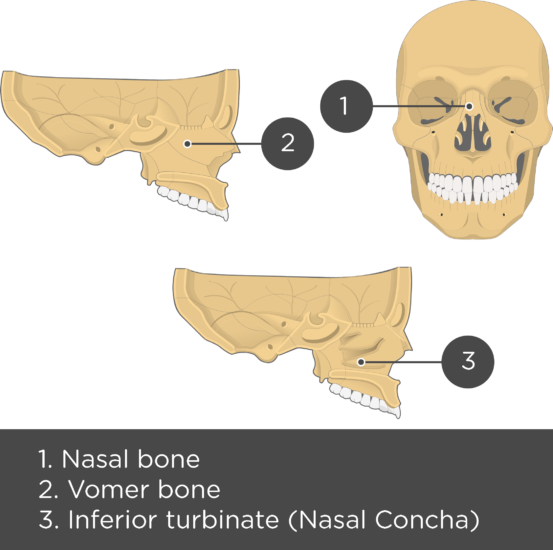 Some of the smallest are the two nasal bones, two inferior turbinates (nasal conchae), and the single vomer bone. 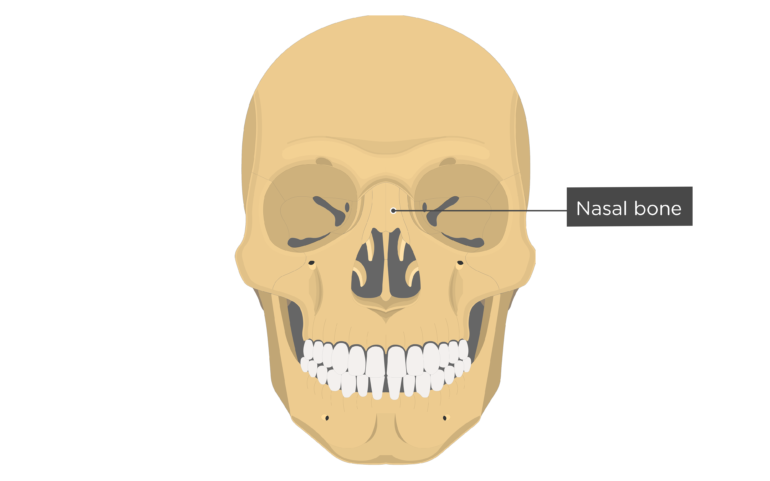 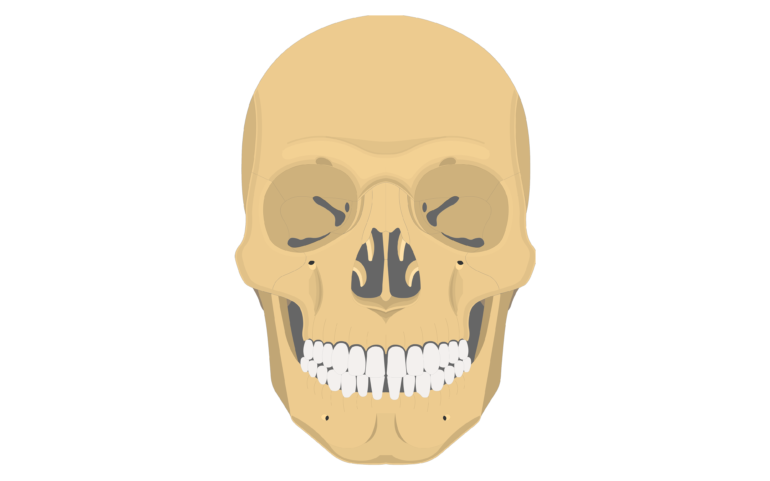 Nasal bones – are two small bones that form the bridge of the nose. 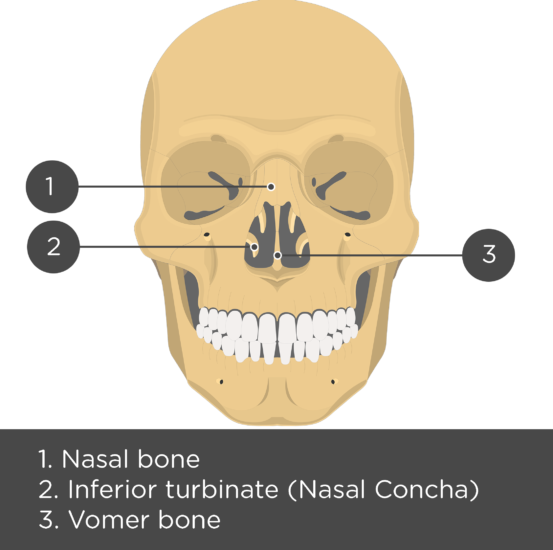 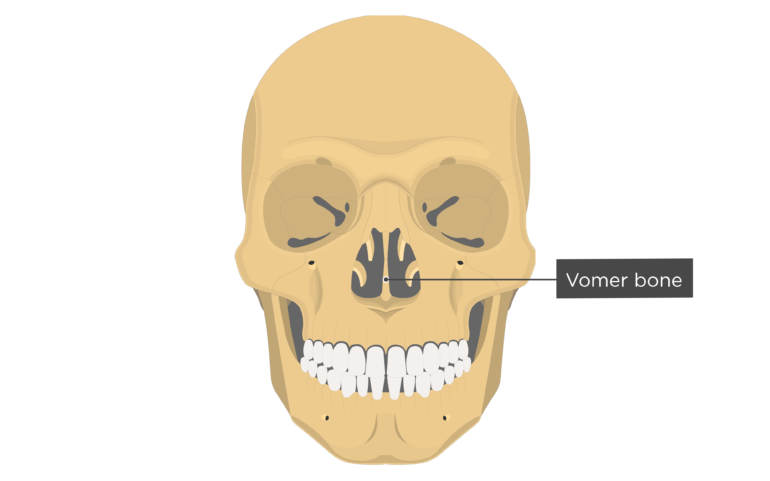 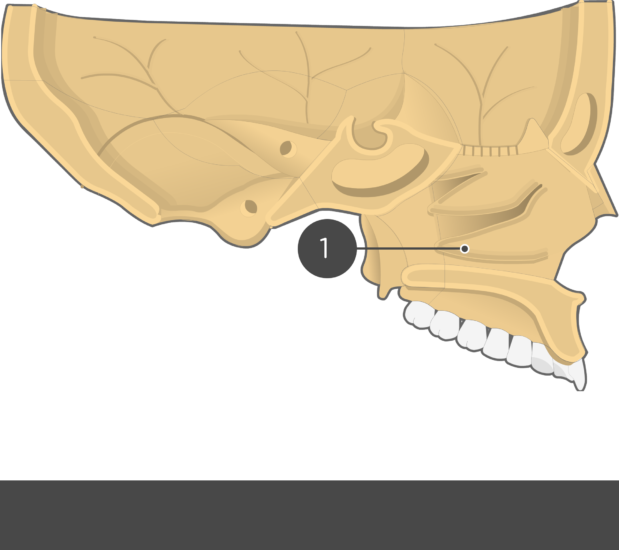 Vomer bone – a thin bone that runs vertically along the midline of the nasal cavity. 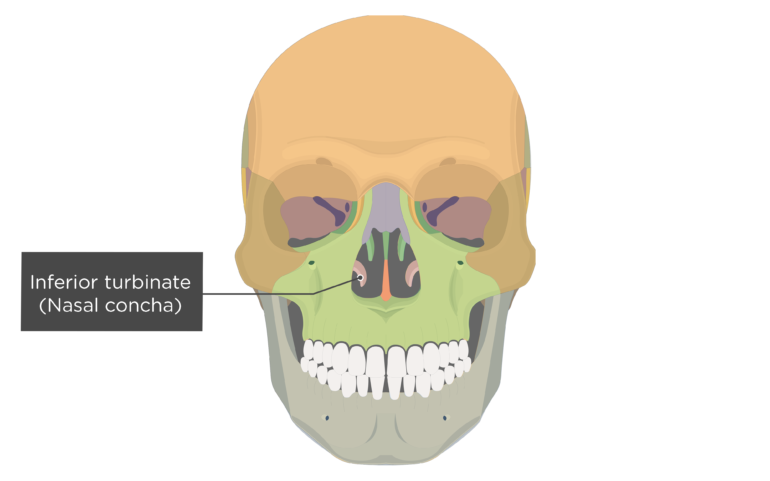 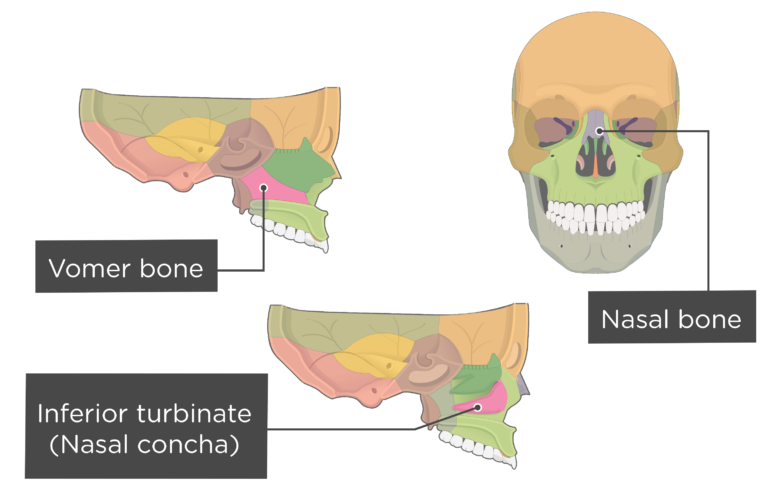 Inferior tuberinates (or nasal conchae; sing., concha) – are two thin bones that extend into the nasal cavity from the lateral walls of the maxilla bones. 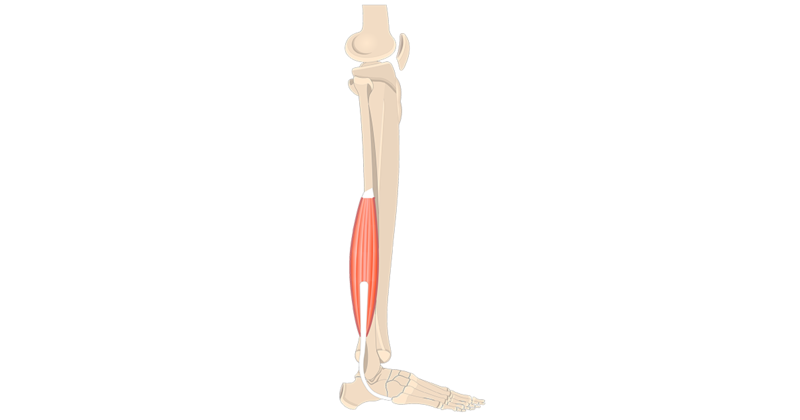 Vomer bone – (L., – plowshare) – a thin, plow-shaped bone. 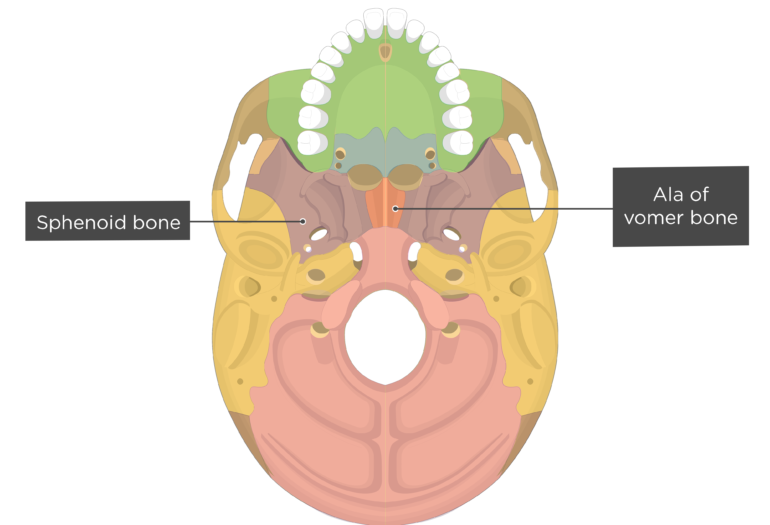 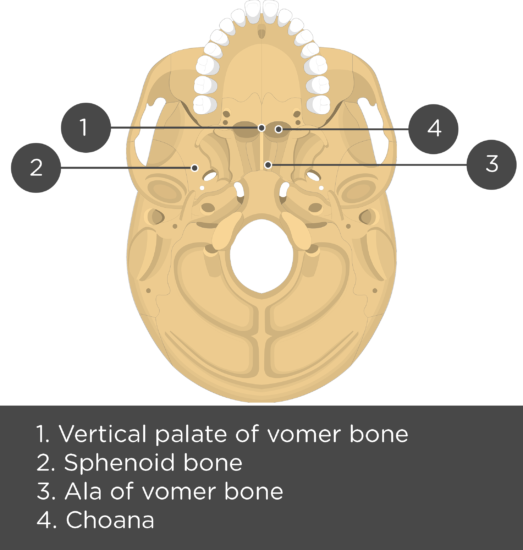 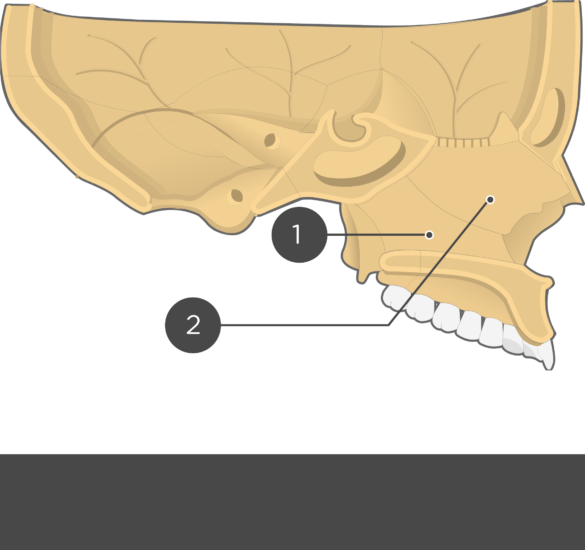 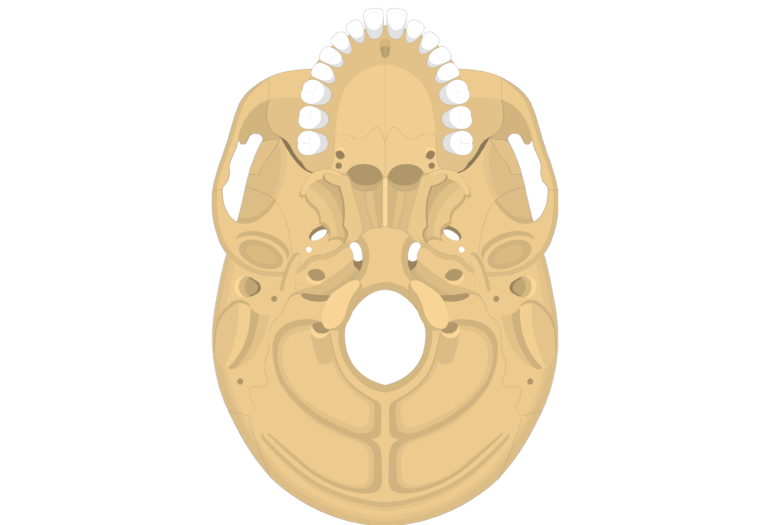 The vertical plate of the vomer bone articulates with the perpendicular plate of the ethmoid bone to form the bony nasal septum. 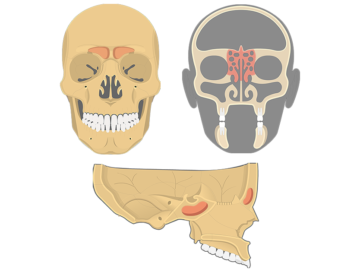 The septum separates the nasal cavity into two halves called nasal fossae. Inferior turbinates – are two, small bones that extend into the nasal cavity from the walls of the maxilla bones. 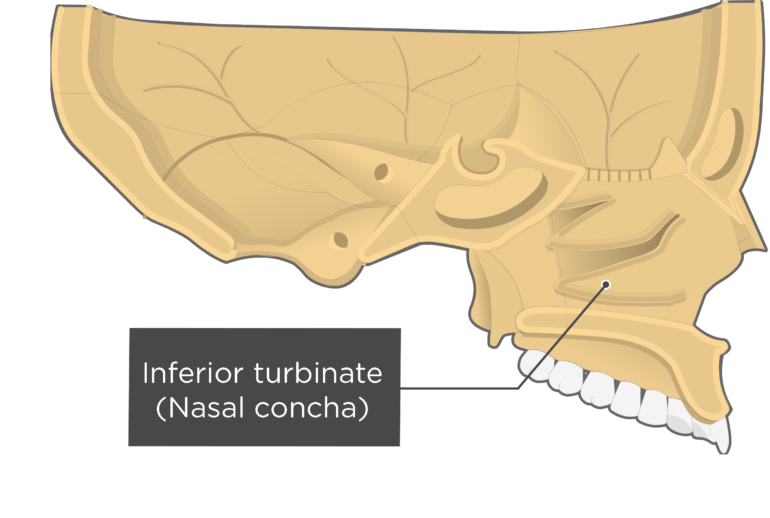 Because of their curved shape, the turbinates are also called nasal conchae (L., concha – shell and Gr., konche – mussel or cockle). A thick layer of mucous membrane lines the turbinates, and the secreted mucus helps warm, humidify, and filter the air as it travels through the nasal cavity. 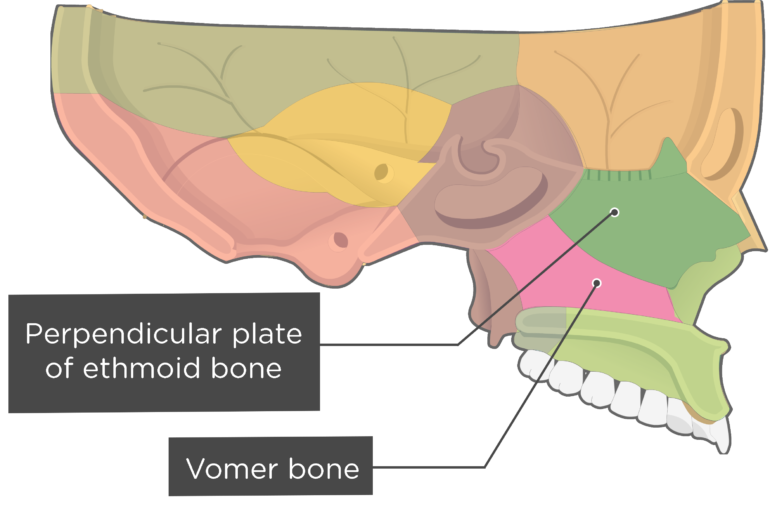 The vomer bone is primarily composed of a vertical plate and two small horizontal extensions. 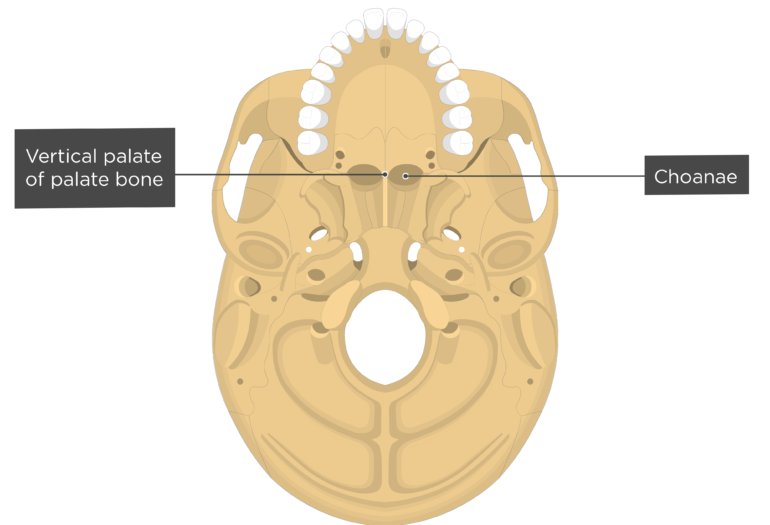 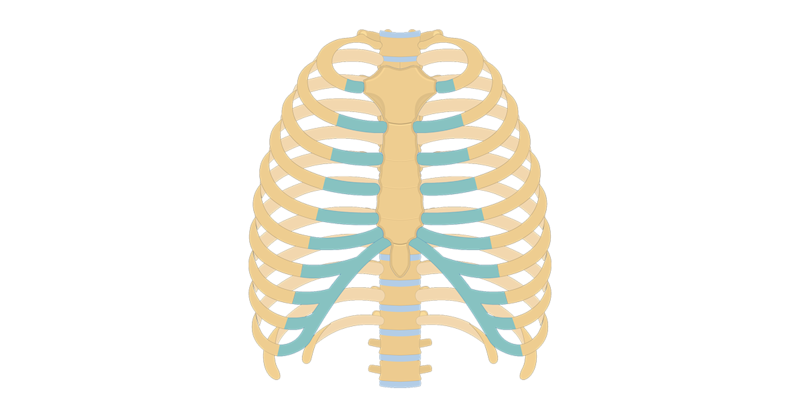 The vertical plate divides the nasal cavity into left and right chambers. It also partitions the posterior opening to the pharynx into left and right choanae (singular; choana) or posterior nares (singular; naris). 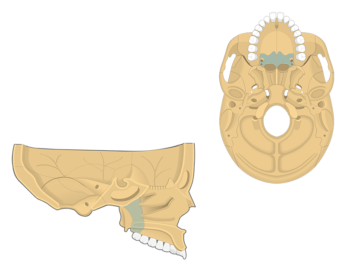 The alae (singular; ala) are small, wing-like horizontal (or lateral) plates that articulate with the sphenoid bone. 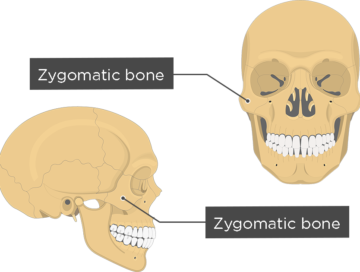 The zygomatic bones are two facial bones that form the cheeks and the lateral walls of the orbits. The paranasal sinuses are cavities of various sizes that function to secrete mucous into the nasal cavity, lighten the skull, and resonate the voice. 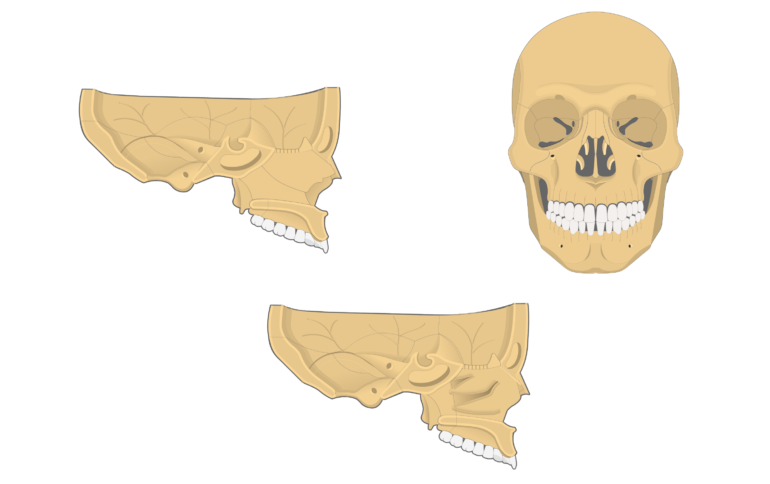 Palatine Bones are facial bones that are located between the palatine processes of the maxillary bones and the pterygoid processes of the sphenoid bones.